Radio interview with Columbian National Radio (South America)! Here is the audio of my recent interview about Blessed Mother Teresa with the Colombian Radio station in South America. It's in Spanish and English! I don't understand Spanish so I hope it is translated well from the English interview. Anyone out there who understands Spanish, please leave a comment and let me know. :) And, for non-speaking Spanish folks, you can listen in and understand the English part. I think it's very interesting to hear both the English and Spanish. In addition, I believe this is a secular national radio station, so it was wonderful to speak of Jesus, prayer, and Mother Teresa! 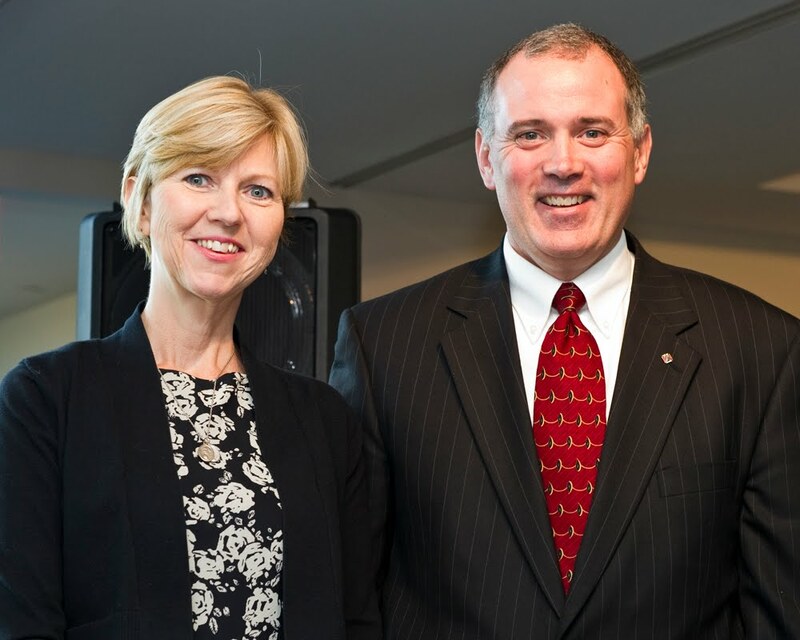 An excerpt from Today's Catholic article..."Having nurturing and dynamic speakers present at the conference is a top priority for the committee and this years five presenters bring a wealth of knowledge and insight on women’s issues. One of the presenters, Donna Marie Cooper O’Boyle, will share her personal story of how she came to know and have a decade long friendship with Blessed MotherTeresa of Calcutta and how women today can carry out her mission to help the poor..."
Here is the pdf to an article just published in Today's Catholic (Texas) regarding an event where I will give a talk and do a book signing at in San Antonio this October. I hope you enjoy the article. I'll be speaking about dear Blessed Mother Teresa. I hope that the folks who are in that area may attend. I hear there will be about 750 or so women there in attendance and four other speakers will present as well. You'll learn more about it in the article. Catching up, Mother Teresa, San Antonio, Radio and TV! I'll be posting the audio of my radio interview about dear Blessed Mother Teresa with a Colombian, South American radio station very soon. That was a very interesting interview to do. It was the first time, besides Vatican Radio, that a radio station from a different country requested an interview. Actually, I did have an interview with Ireland too one time. Stay tuned for the very interesting Colombian interview. I announced the winner from all of my "fans" on Face Book yesterday. It's Christina Cariglino Velie. She'll receive a copy of my newest book: A Catholic Woman's Book of Prayers. I'll be posting a news article from a Catholic newspaper in San Antonio, Texas which will set up my appearance there in October. Here's a website you can check out about the event. I'll be speaking about Blessed Mother Teresa. I will also be part of a TV show Wednesday night with regards to the San Antonio event. It's a San Antonio Catholic TV station doing a show about the Women's Conference. That show will be airing on Catholicism Live! I have been asked to call into the show at 9:10 PM Eastern time. I'll get more details soon. Oh, and did I tell you I'm going to Rome in a few days? I'll be in Rome for Mother Teresa's feast day! I'll have to fill you in more tomorrow if I can. Have a BLESSED night and may the Angels surround you! I can't wait to buy my Mother Teresa stamps and use them on everything - bills, correspondence - everything! I encourage you to also use the stamps to get that beautiful "saint's" face circulating all over the place! If you are a blogger and plan to use the Mother Teresa stamp, please link to this post and spread the word! Do you have ideas regarding using this stamp? Leave a comment please. You can find some news here at the Knights of Columbus. And here. If you feel inclined, leave a comment at the News 8 coverage of the unveiling ceremony of the stamp at the Knights of Columbus Museum on Mother Teresa's 100th birthday here to balance out the bad ones. Take a look here to leave your comment. I was there at the New Haven, CT Museum on Mother's birthday to present a talk and do a book signing. It was a beautiful, grace-filled day! 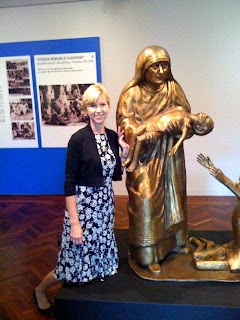 The Knights of Columbus Museum has been holding a very impressive exhibit in honor of Mother Teresa complete with relics, her sari, a replica of her room, and so much more. You can learn more about it at the Knights of Columbus links above. And there's more good news - the exhibit time has been extended to April 3, 2010! My interview with Fr. Gabriel on "Word to Life" radio show on The Catholic Channel on Sirus Radio yesterday. The segment speaks about the readings for this week end regarding humility. I was invited on the show to speak about dear Mother Teresa. You can listen to the segment here. I am honored to have been on the same show along with Fr. Charles Connor who is on first - very inspiring interview about St. Thérèse of Lisieux. I speak about Blessed Mother Teresa after Fr. Connor's interview. And speaking of humility...here's a very beautiful quote from St. John of the Cross - "In detachment, the spirit finds quiet and repose for coveting nothing. Nothing wearies it by elation, and nothing oppresses it by dejection, because it stands in the center of its own humility." I thought I was only being audiotaped at the time. Turns out it was videotaped, so here it is above. Just click in the center of the square image above. Enjoy! 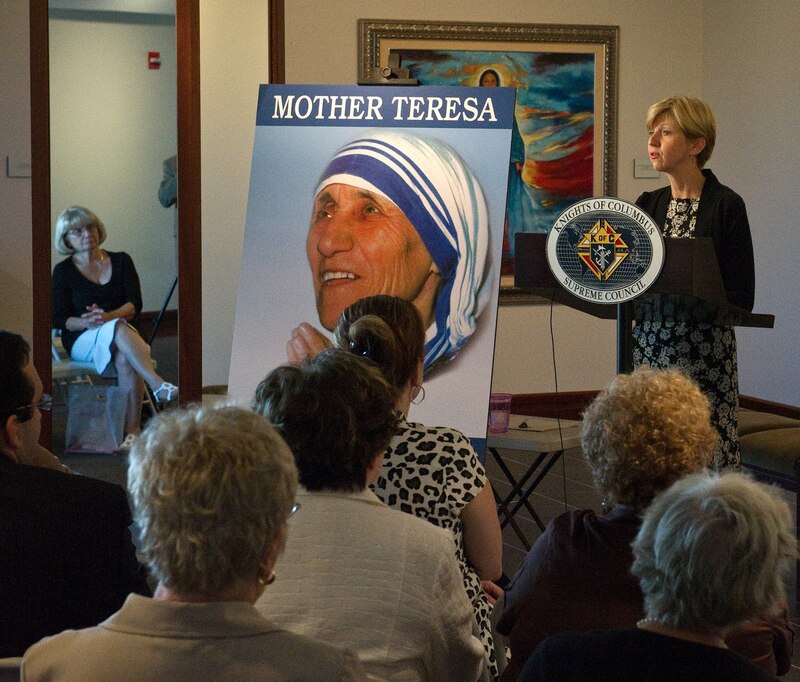 at the Knights of Columbus Museum in New Haven, CT yesterday on Mother Teresa's birthday. Delighted to see a Face Book friend and Connecticut resident, Michelle along with her children. Yay! The new Blessed Mother Teresa stamp unveiled! What an honor to pose with it! One of the many wonderful people who came to the event and my book signing. 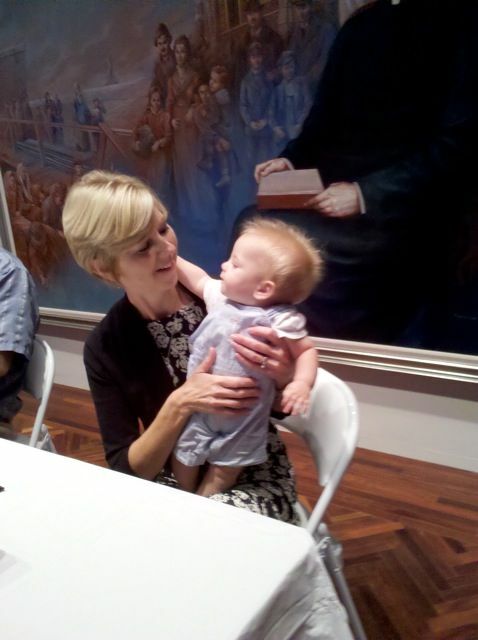 A sweet little one visited me at my book signing table. Posing with the bronze statue of Mother Teresa at the Museum. At the end of the day - me with Peter A. Sonski Jr., the Director of Public Relations for the Knights of Columbus. What a joyful, grace-filled day! Thank you, Knights of Columbus and staff for your wonderful and loving hospitality shown to me and my husband on Mother Teresa's 100th birthday. I'm sure that dear Mother Teresa was looking down upon all of us and blessing us. The Knights of Columbus announced yesterday that the Mother Teresa Exhibit has been extended to April 4, 2011! I hope you can get there. It's at One State Street, New Haven, CT. Go to the Knights of Columbus Museum website for more information. Or call (203) 865-0400. Also check the Official Knights of Columbus website for more on the 100th birthday celebration of Mother Teresa. My talk: "Discovering Calcutta in our Midst: Mother Teresa's Lessons of Love" will be added to the Knights of Columbus website soon. I'll keep you posted on that. I'll be on LIVE of Sirius Radio The Catholic Channel, WORD TO LIFE show at around 1:35 PM today. It will be posted on the friar's website tomorrow. I hope you can tune in! You can get a free trial via the internet and listen to the show. I didn’t first run into Mother Teresa in Calcutta, India among the dying she was known to serve at Nirmal Hriday (Pure Heart) where those in their last moments lie on simple mats, lovingly attended to by the Missionaries of Charity Sisters. I didn’t visit with Mother Teresa at the Motherhouse where she spent much time at 54 A Lower Circular Road in Calcutta — that address that became instantly recognizable to me every time I spotted it on the corner of the envelopes of the letters I would later receive from her. No, I first met the “saint of the gutters” in the capital of one of the richest nations in the world. I found her “by chance” in Washington, DC. Mother Teresa was visiting her Sisters and helping to care for the terminally ill cancer and AIDS patients lying on simple beds in their “Gift of Peace” home at the convent located in a poorer section of that great city and command center of the U.S. government. I actually caught my first glimpse of Mother Teresa one summer morning when she walked quietly past me and knelt down for Mass celebrated in the Missionaries of Charity’s modest chapel. 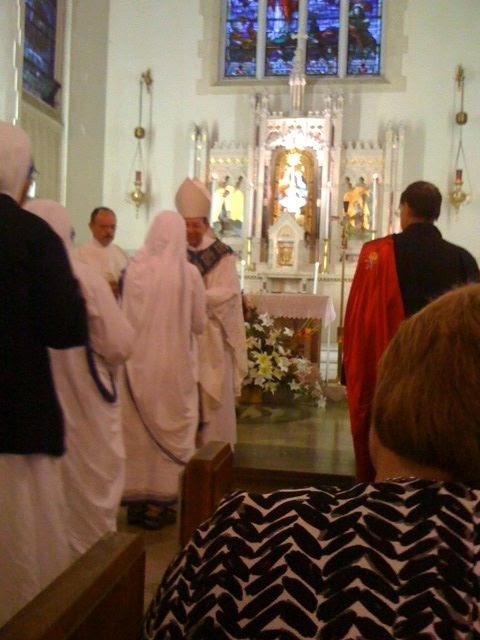 The Sisters had invited my family to Mass at their private chapel in DC. How fortunate we were that Mother Teresa happened to be visiting the country at that time! Straight after Mass, rendering me speechless, Mother Teresa walked directly towards me asking about my little daughter nestled in my arms and stretching her worn, wrinkled hand to touch Jessica tenderly. Being in the same chapel was blessing enough for me — it was more than enough, I thought. You can imagine my delight when I understood as she approached, that I was also given the gift to personally meet and speak with Mother Teresa in the intimate setting of the convent. I had always considered Mother Teresa (now referred to as “Blessed Teresa of Calcutta” because of her beatification) to be a living “saint.” I admired her decades of selfless holy service caring for the “poorest of the poor” all over the world. Suddenly, there she was, the hero of the poorest of the poor, caring for my family — giving us her time — touching us — speaking to us — blessing us! I didn’t even have to leave the U.S. to encounter this inspiring and remarkable woman. 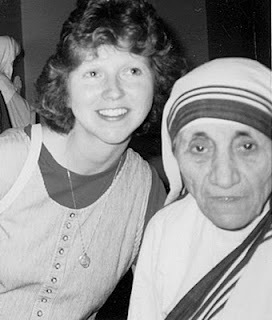 After the initial shock of meeting Mother Teresa, I was struck by her height, or lack thereof. Not much taller than one of my daughters, she stood before us with a prominent looking hump on her back. It startled me. I hadn’t noticed it in photos of her I had seen. My mind quickly attributed the severe protrusion to her constant stooping to care for the dying. She appeared frail, even ordinary. But, I knew in my heart that appearances can be very deceptive and that she was indeed a “power house” of faith, hope, and love. 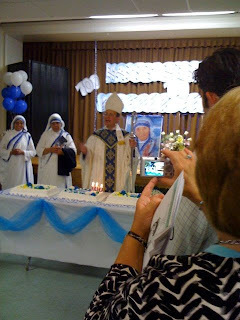 In the Apostolic Exhortation, Christifideles laici, Pope John Paul II has told us, “The saints have always been the source and origin of renewal in the most difficult moments in the Church’s history.” Thanks to God’s providence, I lived in the time of Mother Teresa and came to know the virtuous “saint” through at least a dozen more meetings and a couple of dozen personal letters from her and even a phone conversation between Calcutta and the U.S. Mother Teresa was not an unreachable or abstract saint of hundreds of years ago, but a real live, flesh and blood woman, no stranger to the realities of modern day life, someone whom I could speak and correspond with, one whom God had given to our era to raise up other saints and essentially teach us how to truly love the poor. God used a simple, small, frail woman who called herself a sinner and “just a stubby little pencil in God’s hands” to win thousands upon thousands of souls for Heaven. Mother Teresa didn’t achieve this by getting involved in politics, or trying to analyze systems, ideologies, or economic patterns. Rather, she accomplished her amazing work through her one-by-one approach — of meeting each person face-to-face joyfully and ministering to them with Christ’s love. This she did even when heavily burdened with suffering herself including physical ailments and also a dark night of the soul, a secret suffering she carried quietly close to her heart. Her example of “loving until it hurts” is utterly edifying. When asked why she didn’t try to fight for injustice and human rights or change structures, she explained that, while she and the Missionaries of Charity were not unaware of those things, “Our mission is to look at the problem more individually and not collectively. We care for a person and not a multitude. We seek the person with whom Jesus Christ identified himself with when he said, ‘I was hungry, I was sick.’” This was her approach with everyone and everything she came in contact with. Her simple trustful outlook may have come up against criticism, but it never failed. Mother Teresa summed up the way she cared for the poor by saying, “To know the problem of poverty intellectually is not to understand it. It is not by reading, taking a walk in the slums, admiring, and regretting that we come to understand it and discover what it has of bad and good. We have to dive into it, live it, share it.” And this is exactly what she did. The life of working amongst the poor and outcasts drew me in — it intrigued me immensely. I even felt an intense call. Yet, I was a mother of five growing children. I knew my place was here in the U.S. and not in Calcutta or another poverty stricken area. After all, it was Mother Teresa who often preached, “Love begins at home.” Mother Teresa inspires us all to answer God with our own “Yes” to His plan for us for wherever we are. God asks us to care for the “poor” whom He places in our midst. I would later found an apostolate called “Friends of Veronica” as an outreach to the lonely and forgotten in imitation of St. Veronica’s loving and courageous gesture of making her way through the crowd to console Our Lord by wiping Jesus’ bloody and swollen Sacred Face. 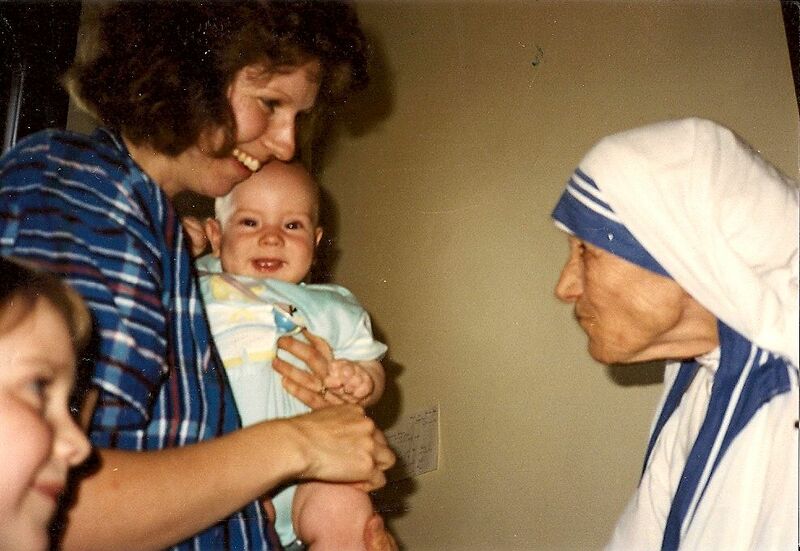 Every word from Mother’s letters to me and every additional encounter with Mother Teresa that unfolded in the years that followed my first meeting with this modern-day saint pierced my heart and drove home a very essential and formative lesson for me. I didn’t need to traipse off to Calcutta to do Mother Teresa’s work. My spiritual mentor dressed in her simple cotton sari trimmed in Blessed Mother blue taught me that the poor may very well be the person in the cubicle beside us in the workplace, a lonely neighbor, or a family member starving for love right under our own roof. She showed us all that the poorest of the poor are not only those starving in third world countries, but they are the folks right here in our affluent country craving attention, love, and care. The work is indeed cut out for us in our own homes, neighborhoods and communities when we are willing to open our eyes, ears, and especially our hearts to Christ’s call to love. 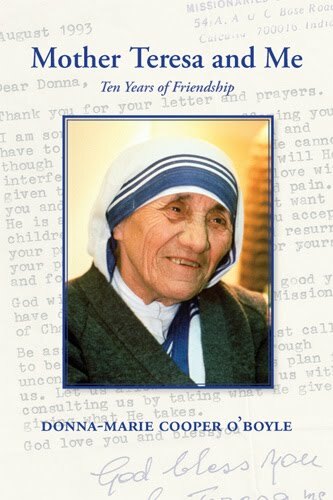 In my book Mother Teresa and Me: Ten Years of Friendship, I set out to share my blessings and further the work of Mother Teresa by telling the world who she was and what she preached in an attempt to draw others closer to God and inspire them to love Jesus in the poor as Mother Teresa did so beautifully. The publisher encouraged me to “tell the whole story.” So, the book became part biography, part memoir. I have woven in many true stories of people I met along the way and my own experiences as my life unfolded in ministry after meeting Mother Teresa. If we will bear in mind an insight that Blessed Mother Teresa had intimately understood and expressed, “Prayer makes your heart bigger, until it is capable of containing the gift of God himself,” we may then be able to offer our own prayer-filled hearts to all in need, starting first within our own homes to continue dear Mother Teresa’s work. Let’s do that vital work of evangelization with joy and love — by serving Jesus in one another — in both small and big ways. God bless you! You can see the article here at Catholic Exchange. Photos in no particular order - just sharing some highlights. Of course, I would have liked to have more, but I didn't want to take photos at Mass. Beautiful flowers that the Knights of Columbus gave me. These are just a few photos from my cell phone (the baby pic is from a Mom's camera who was present at the event). 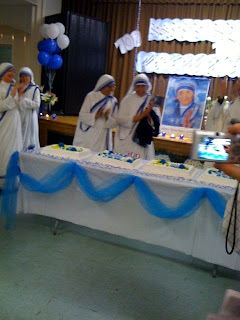 Many professional photos were taken at the event today on Mother Teresa's 100th birthday. 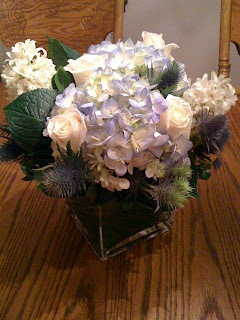 When I receive them I will post them for you. I have the audio for my chat with Teresa Tomeo from this morning about dear Mother Teresa and her 100th birthday celebration today. You can listen here. 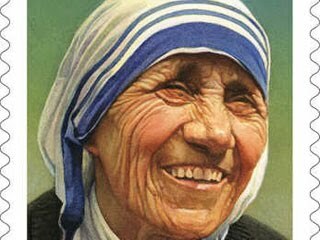 I pray that dear Mother Teresa is smiling down on all of you! With a grateful heart for all you have given to the world while you were here on Earth and now from Heaven! Just on the radio LIVE with Gus Lloyd on Seize the day, The Catholic Channel on Sirius Radio. I'll be on Ave Maria Radio with Teresa Tomeo at 9:15 AM Eastern then zooming over to my big event at the Knights of Columbus in New Haven to speak and book sign. I barely have time to type this, actually no time right now. Take a look at my article at Catholic Exchange today here and other new items hopefully posted soon. Blessed Mother Teresa bless us please! Happy 100th birthday! NEW HAVEN — The largest Roman Catholic fraternity will honor one of the faith’s most celebrated modern women Thursday. Mother Teresa would have been 100 Thursday, and the Knights of Columbus will celebrate her birthday with a cake and a party that includes the unveiling of a postage stamp that will be issued in her honor next month. Mother Teresa was born Agnes Gonxha Bojaxhiu in Skopje, Macedonia, on Aug. 26, 1910, and became best known for her work among the poor in Calcutta, India, where she founded the Missionaries of Charity. She won the Nobel Peace Prize in 1979 and died in 1997. Her life has been the subject of an exhibit at the Knights of Columbus Museum, 1 State St., which runs until Oct. 4. “It also has a unique facet in that Mother Teresa has had a bit of a relationship with the Knights of Columbus,” Sonski said. She visited the Knights’ headquarters in 1988, seeking help with her order’s printing needs, and spoke to the staff. The K of C gave her the Gaudium et Spes (Joy and Hope) award in 1992. Mother Teresa was beatified by Pope John Paul II and many are hoping she will achieve sainthood. 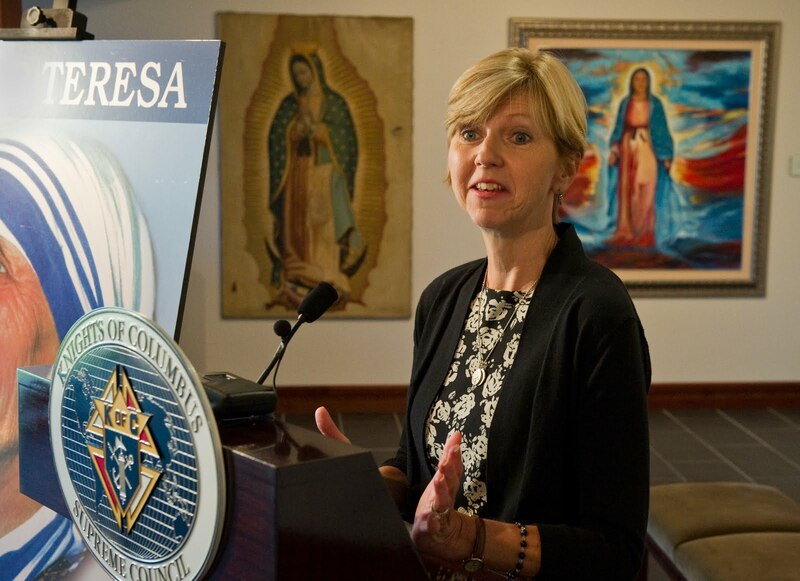 She said she will speak on another of Mother Teresa’s themes: “the poor that surround us in our affluent country here that are starving for love.” We are “all called to be saints,” Cooper O’Boyle said. 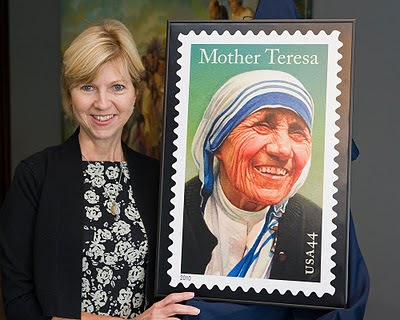 The 44-cent U.S. postage stamp for Mother Teresa will be issued Sept. 5, and there will be a special cancellation ceremony at the museum Sept. 8, Sonski said. The festivities will begin about 11:45 a.m. at the museum, complete with a cake with 100 candles. Mother Teresa’s centenary became the subject of some controversy when the management of the Empire State Building rejected a request to light the top of the skyscraper in her order’s blue and white. Instead, it will be lit red, white and blue for the 90th anniversary of women gaining the right to vote. Mother Teresa would have been 100 years old this Thursday, August 26th. Here is an article from the New Haven Register today regarding the celebration on Mother Teresa's birthday this Thursday in which I will be a speaker and will sign my book Mother Teresa and Me: Ten Years of Friendship. I remember when I first heard about the Mother Teresa stamp coming out and was very excited. Now, I am honored to be part of the event in which the stamp will be unveiled at the Knights of Columbus international Museum on Mother Teresa's birthday! I'll be celebrating along with the folks there and the Missionaries of Charity Sisters having birthday cake in Mother's honor. I am honored to be included in the Knights of Columbus' website here. 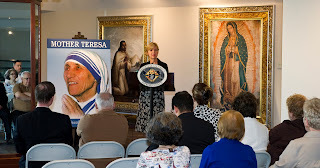 Take a look at this Mother Teresa slide show at the Knights of Columbus headquarters.... This is great! NEW HAVEN, Connecticut, AUG. 24, 2010 (Zenit.org).- Years after her death, Blessed Teresa of Calcutta still teaches us how to love by her words and humble example, says author Donna-Marie Cooper O'Boyle. O'Boyle, author of "Mother Teresa and Me: Ten Years of Friendship" (Circle Press, 2009), will be speaking about her personal experiences with the saintly nun at an event celebrating the founder's 100th birthday on Thursday. 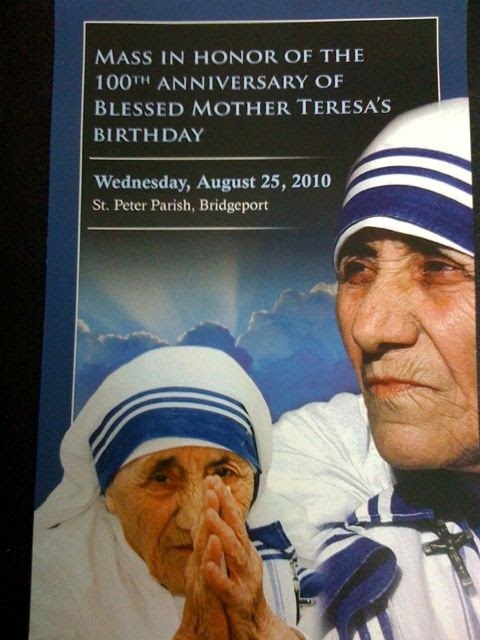 Thursday's celebration, sponsored by the Knights of Columbus at their New Haven museum, will include an unveiling of the Mother Teresa U.S. postage stamp. O'Boyle, who will give an address on "Discovering Calcutta in Our Midst: Mother Teresa's Lessons of Love," told ZENIT that the nun and founder of the Missionaries of Charity still has an important message for us today: "Love one another." Even 13 years after her death, the author said, "Mother Teresa's love for Jesus transcends time." O'Boyle affirmed, "She beckoned us all to answer our own calls to holiness in our lives -- to serve Jesus in one another -- to thirst for Jesus' love and love him in return." She continued, "Now, 100 years after her birth we are blessed with the lessons of love from a remarkable yet humble woman's life." This woman "may have looked overly ordinary, but because she loved Jesus so earnestly her life was immensely extraordinary and the effects of that love radiated out to the entire world," O'Boyle told ZENIT. 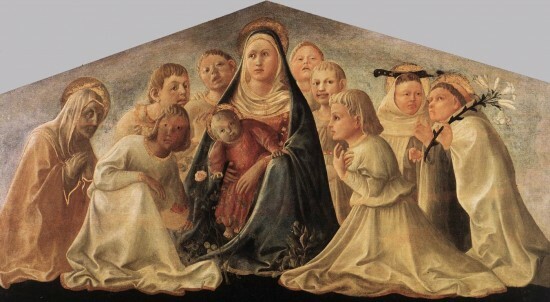 She observed that the nun's "one-by-one approach to serve Jesus in all she met changed the world and opened our eyes to understand the plight of the poor." "She taught us that the poor are not just those starving for a piece of bread, but are those even in affluent areas starving for love and care," the author affirmed. O'Boyle concluded, "We too can love as Mother Teresa loved by answering our Lord with our own 'Yes!' and living the Gospel of Mathew 25:35-46 as she did: 'Just as you did it to one of the least of these who are members of the family, you do to me.'" The Knights of Columbus Museum is also currently featuring an exhibit on "Mother Teresa: Life, Spirituality and Message," which will run through Oct. 4. It includes items such as the founder's sari, personal articles, and a full-scale replica of her convent cell in the Calcutta convent. For more information visit the Knights of Columbus here. We're getting closer to Mother Teresa's 100th birthday - this Thursday, August 26th. Here's a link to peek at. I'll be chatting with the wonderful Gus Lloyd about Blessed Mother Teresa on Thursday, August 26th (Mother Teresa's 100th birthday) at 8:30 AM Eastern time on The Catholic Channel, Sirius Radio, "Seize the Day with Gus Lloyd." I hope you can tune in. Here's the website for more information." I think you have to subscribe to Sirius Radio to tune in. Are you awake at night? Do you pray during the night? I heard from Our Sunday Visitor Publishing Company today that my new book A Catholic Woman's Book of Prayers is now in their office. I immediately put in my order and should be receiving a few cases within a few days. You may order your autographed copies now. You'll be one of the first to get this book which addresses ALL women - single, Religious, married, and mothers! You can order your copy or copies here. "With all the mixed messages that women receive from society today, women can be distracted from--and even unreceptive to--the deep and abiding love that Christ has for them. Whether single or married, religious or consecrated, parenting children, or spiritually mentoring others, women need to know that the Lord understands the many challenges they face, their desire for inspiration, and, above all, their need to be affirmed as women. 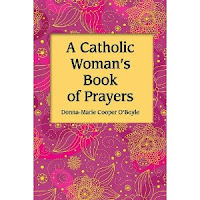 Through this book of original and traditional prayers from one of the top ten most fascinating Catholics of 2009 as rated by Faith & Family Live, women can realize God's divine Love, thrive in inspiration from Saints and the Church and rest in the affirmation of the "feminine genius" that Christ offers." I'd also like to point out that this book will speak of the joys and challenges of womanhood. Many of the tough issues that some Catholic woman face are addressed in this book including: miscarriage, infertility, menopause, estrangements, divorce, and much more. The joys of Catholic womanhood are indeed overflowing in this book too! :) Church teaching is woven throughout the book as well as the wisdom and inspiration from the Saints. It's sturdy, compact and the perfect size to stash in your purse, backpack, diaper bag, or to keep nearby on the coffee table or night stand. I know you're going to love it, if I may say so myself! New version of the video. Have a look! My new book for Catholic Women is coming very soon! So looking forward to Mother Teresa's birthday! 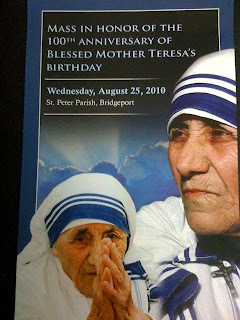 (NEW HAVEN, CT) — At a time when meaning and achievement in life was too often defined by what one has, Mother Teresa of Calcutta rose to the heights of global recognition and respect by giving everything away. The Knights of Columbus Museum is hosting the American premiere of an exhibition, Mother Teresa: Life, Spirituality and Message, in observance of the 100th anniversary of the sainthood candidate’s date of birth on August 26, 1910. The diminutive nun was a giant among international humanitarians. Her life’s undertaking and that of the Missionaries of Charity, the religious order she founded, was to provide “wholehearted, free service to the poorest of the poor.” Her outreach included refugees, AIDS victims, lepers, former prostitutes and addicts, the mentally ill, sick and abandoned children, the aged, and physically handicapped. Her community of religious sisters, brothers and priests run schools for street children, soup kitchens, orphanages, homes for women, hospices for the dying, providing service regardless of religion or ethnicity. Among Mother Teresa’s many honors were the Nobel Peace Prize (1979), the Presidential Medal of Freedom (religion, 1985) and the Congressional Gold Medal (humanitarian and charitable activities, 1997). She was also the inaugural recipient of the Knights of Columbus’ highest honor, the Gaudium et Spes Award (Christian faith and service, 1992). The exhibition, which runs from March 25 - Oct. 4, 2010, is a historical presentation, chronicling Mother Teresa’s life from childhood to beatification by the Catholic Church. It includes biographical information, artifacts such as her sari and other religious and personal articles, as well as a full-scale replica of Mother Teresa’s convent cell (room) in her Calcutta convent. Both during her lifetime and after her death, the Knights of Columbus has supported the work of her religious order financially as well as providing printing services for the spiritual support of her religious order and its members. Knights also have supported and volunteered in her order’s North American soup kitchens. Mother Teresa addressed the assembled employees of the Knights of Columbus in the organization’s New Haven headquarters in 1988. Details of her close relationship with the K of C are also included in the exhibit. The Knights of Columbus Museum, located at One State Street in New Haven, is open Wednesdays-Sundays from 10 a.m. - 5 p.m. Admission and parking are free. Call 203-865-0400 or visit kofcmuseum.org for directions or more information. 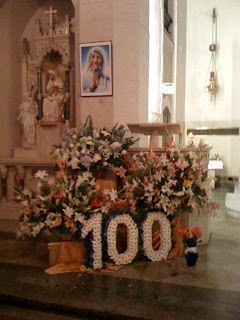 Blessed Mother Teresa is coming up on 100 years old! Blessed Mother Teresa of Calcutta was in many ways a study in contrasts. The diminutive founder of the Missionaries of Charity was at once the epitome of humility and yet a towering figure in the world at large. She was the definition of compassion toward others while taking on tremendous sufferings and sacrifices. She struggled with darkness in her own prayer life but remained a beacon of light to others. She promoted a spirituality that was on its surface so simple but at its core so profound. It would be easy to get caught up in the awesomeness of Mother Teresa and think that what she preached was beyond anything that “regular” people could practice. But the real message of this “saint of the gutter,” whose 100 th birthday will be celebrated with much fanfare and some controversy around the world on Aug. 26, was that we are all called to be saints, and we can begin right where we are at this moment. “Holiness is not the luxury of the few, it is a simple duty for each one of us,” she once said, emphasizing that peace and love and compassion must begin first at home, among the people closest to us. Please see the entire article here. I am honored to be included. More news coming up about Mother Teresa's birthday, the new postage stamp and my humble involvement, by God's grace. Pray for me please. I'm praying for you! 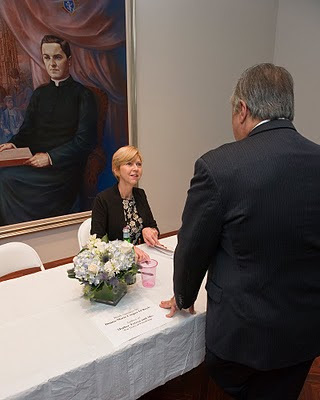 While at the Catholic Marketing Network (CMN) conference last week, I did a couple of book signings. One was Wednesday evening in the grand ballroom. Book store owners came by to peruse the newest books to then decide what they'd like to carry in their stores. It was fun meeting them and chatting about my books with them. Other signings were held at the Catholic Word Booth throughout the conference. Here's a way to hear the audio that was taped at our Blogging Panel at the recent CMN conference. I was honored to be seated with Lisa Hendey and Mark Shea. Karina Fabian of Catholic Writer's Guild was our gracious and talented moderator. Exciting discovery - my new book! As I took a quick walk around the trade floor between a couple of my events at the CMN conference last week, I happened upon the Our Sunday Visitor booth. I have two books published currently with them: Catholic Prayer Book for Mothers and Catholic Saints Prayer Book. And my newest book with OSV will be released next month. 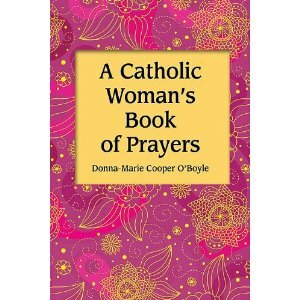 It's titled A Catholic Woman's Book of Prayers. I spotted the "mock" copy of the book displayed prominently and so I posed for a photo op with it. With all the mixed messages that women receive from society today, women can be distracted from--and even unreceptive to--the deep and abiding love that Christ has for them. Whether single or married, religious or consecrated, parenting children, or spiritually mentoring others, women need to know that the Lord understands the many challenges they face, their desire for inspiration, and, above all, their need to be affirmed as women. 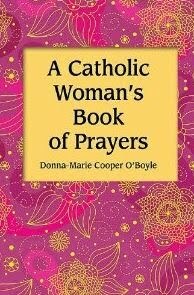 Through this book of original and traditional prayers from one of the top ten most fascinating Catholics of 2009 as rated by Faith & Family Live, women can realize God's divine Love, thrive in inspiration from Saints and the Church and rest in the affirmation of the "feminine genius" that Christ offers. Another highlight of my fabulous time at the CMN (Catholic Marketing Network conference) this past week was giving a joint presentation with my dear friend and publisher Claudia Volkman of Circle Press. We also presented together last year at the CMN. At that time, our talk was about the ideal author and the ideal publisher from each of our perspectives. This year our presentation was entitled, "Ten Tips for Would-Be Authors." It was attended by a very wonderful audience. Claudia and I each offered our top ten tips and ended with a 10-Point Checklist - "Do You Have What It Takes To Be A Master Writer?" Our audience was very gracious. It's a lot of fun presenting with Claudia and I hope to present together again next year. One of the highlights of the recent CMN conference for me was to visit Al Kresta again for a radio interview. He's such a light to others through his ministry on the radio. I have seen him at many events and have also had the honor and pleasure of chatting with him at other times as well in various interviews. You can hear our interview by going to the Ave Maria archive on Al's blog here. Look in the left column under Podcast Archives and then click on "Friday, August 6, 2nd hour." I am at the beginning of the segment. We talk about my "EWTN Series: “Everyday Blessings for Catholic Moms” and my book Mother Teresa and Me: Ten Years of Friendship and my friendship with Mother Teresa. I also was finally able to get a photo of the two of us. I carried my camera with me throughout my busy days at the CMN conference so I'd be able to snap a few photos or have some kind person nearby do the honors. More CMN stuff coming up, stay tuned! I'm now back home from participating in the CMN, Catholic Marketing Network conference which was held in Valley Forge, PA from August 3rd through 6th. I headed down to PA on Tuesday with wonderful friends and colleagues from Circle Media (Circle Press, the publishing arm of Circle Press published 3 of my books (Grace Cafe: Serving Up Recipes for Faithful Mothering, The Domestic Church: Room By Room, and Mother Teresa and Me: Ten Years of Friendship) and I also write book and movie reviews for the National Catholic Register which is part of Circle Media as is Faith & Family magazine where I have written as well) and we all settled in Tuesday evening. Wednesday morning it was up bright and early at 5:15 AM to get ready to meet the people in my party downstairs before heading over to the next hotel where we would go to holy Mass which would begin our very busy day at the conference. My first presentation was at 10:15 AM right after the Opening Welcome from Ann Lewis and Karina Fabian of the Catholic Writer's Guild. My talk was entitled "Your Manuscript is Complete, Now What?" It was attended by many writers of manuscripts who were interested in the publishing process, hoping to be published one day. 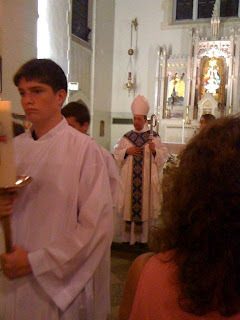 I opened with a remark that I thought it was so wonderful to begin the day with holy Mass and then a Eucharistic procession. Where else can you find that at a writer's conference? We were surely blessed! I enjoyed the audience's company. I don't have a photo of that event at the moment, but will post one when I do receive one from the Catholic Writer's Guild. After my first presentation I hurried over to the blogging panel which was being held right after my talk to meet up with my dear friend and fellow Catholic author (founder of Catholic Mom.Com) Lisa Hendey, as well as Mark Shea, and Karina Fabian who graciously moderated our panel. Our panel was called "Making the Most of Your Blog." It was a lot of fun to participate with these seasoned bloggers as well as to interact with our audience. I plan to continue to post bits and pieces of the conference in the coming days. 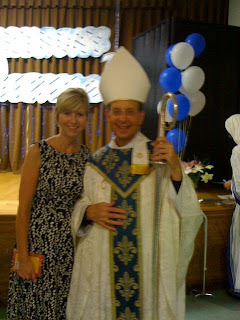 Daily Donna-Marie: A Dose of Inspiration: Review of my book in the National Catholic Registe...: "Donna-Marie Cooper O’Boyle was raising a family 20 years ago when she unexpectedly met Mother Teresa of Calcutta. Over the next 10 years, n..."
I'm getting ready to leave on Tuesday. Please keep me in your prayers. I hope to catch up with you soon and I'll see if I can write a post before I leave. Thanks for your prayers dear friends!